In a catalog essay for the Hammer Museum’s Made in LA biennial exhibition this summer, curator Connie Butler suggested that the Los Angeles art community is perpetually “coming to terms with its status as a megalopolis with a regional art scene.” At the end of a rich year for museum- and gallery-going here in Los Angeles, here’s a look back at a dozen shows that magnified the character of our region on a scale worthy of global attention. Martínez found an artistic home in early 20th century Los Angeles, applying a strong modernist sensibility to depictions of his fellow immigrants’ struggles. In several pieces he ironically used pages of the then-nativist Los Angeles Times as a support medium. Lucha libre wrestling masks in surreal surroundings of color and light were the thematic centerpiece of eight paintings and two floor lamps created by former south L.A. graffiti artist Germs (a.k.a. Jaime Zacarias). This group exhibition of works in various media celebrated two culturally distinctive made-in-L.A. hot sauces, Sriracha and Tapatío. The massive retrospective of works and installations by Mike Kelley, just two years after his suicide, offered a fitting tribute to the career of the seminal and subversive L.A. artist. This astonishing sculptural installation and optical illusion from an artist long associated with the southern California Light and Space movement evoked the “harsh, shimmering, white light that glints off cars and other metal surfaces” in and around Los Angeles. The final show in Kordansky’s old Culver City space was devoted to Weatherford’s Los Angeles series of seven abstract paint and neon tableaux, each representing a location or atmospheric condition in greater L.A. This group show featuring the work of five young Los Angeles artists with personal and family origins in Mexico and Colombia offered multiple perspectives on the experience of standing with one foot on each side of the cultural border. Biberman’s WPA-era mural depicting Abbott Kinney (the man) and the development of Venice used to be on public view in the old Venice post office. This year it was the centerpiece of a one-room exhibition devoted to the history of one of L.A.’s most popular neighborhoods. CAFAM recreates something of the atmosphere of Highland Park’s MorYork cultural and community center in an exhibition of pieces by proprietor Clare Graham, who makes extraordinary works of art and furniture out of basic recycled materials such as bottlecaps, soda can pop tops, dominoes, toy googly eyes, badminton shuttlecocks and lots of other stuff. One of the most fascinating and idiosyncratic artists of mid-20th century Los Angeles finally gets her due in an exhibition devoted to her life and work. 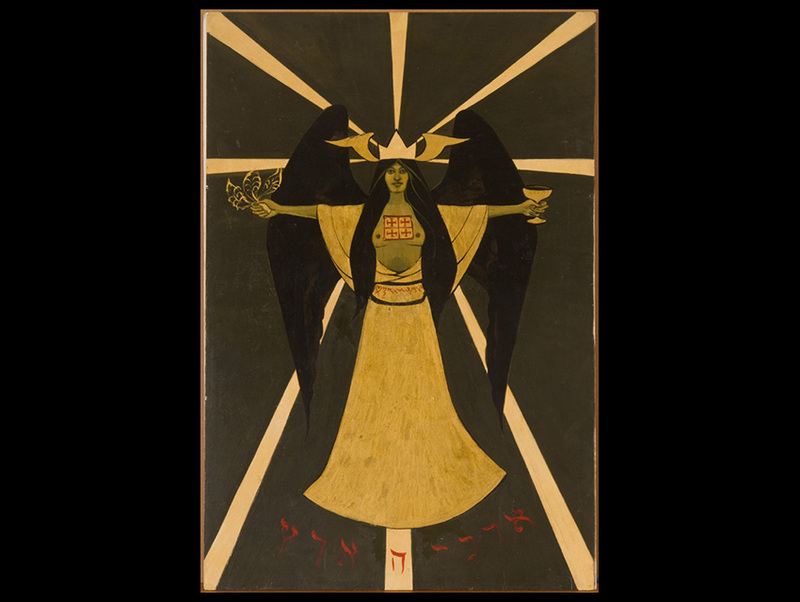 More than a dabbler in the occult, Cameron infused her work with mystical imagery while communing with almost everyone who was anyone in the Los Angeles avant garde.